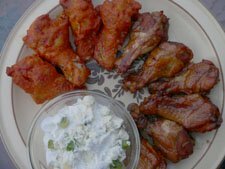 Use this flavorful Blue Cheese Dipping Sauce with Buffalo Chicken Wings, Louisiana Pork Riblets, Vegetables or in a pinch you could even use as a salad dressing. I am a fanatic about blue cheese and love it on just about anything. Be experimental, I bet you will find some new ideas to use this sauce as well. Mix all ingredients in a medium bowl. Cover and keep refrigerated until ready to use. Have plenty of celery sticks on hand, they are a great compliment.